Benvinda! 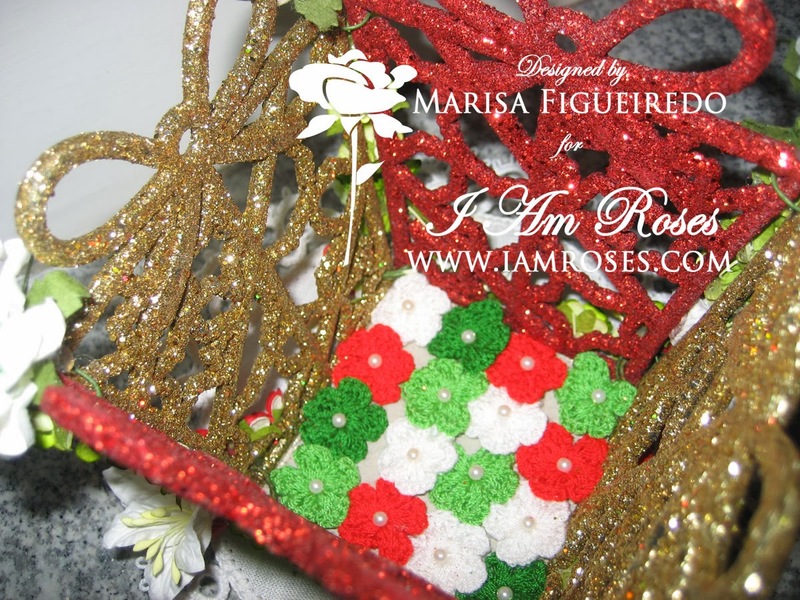 ao blog hop da IamRoses "Tis the Season". Temos tanta inspiração para esta época das nossas designers e convidadas. Chegaste ao meu blog atravez do blog da linda e talentosa Cindy. WELCOME! to the I Am Roses “Tis the Season” Blog Hop. We have so much holiday inspiration coming to you from our Designers & Guest Hoppers. (You should be coming from Cindy's blog, one of my favoutir youtubers!). Salta ao longo dos blogs das Desiogners e das nossas Convidadas especiais e deixa um comentario no seu blog na publicação deste Blog Hop. Hop along to each of the Designers’ & Guest Hoppers' blogs and be sure to comment on their individual "Tis the Season” Blog Post. Existem 2 premios escondidos para 2 sortudas! 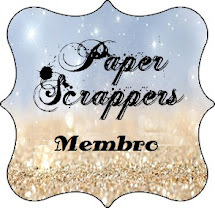 There are 2 HIDDEN BLOG CANDY PRIZES up for grabs in TWO of our hoppers’ blogs! Não te esqueças de ser seguidora de cada um dos blogs e também do blog dos desafios da IAR. 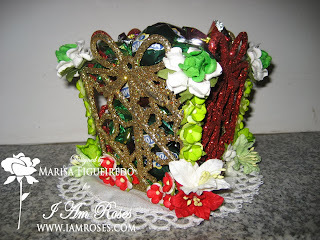 Be sure to Subscribe/Follow the I Am Roses Challenge Blog (http://iamroses-challenge.blogspot.com/). Comentar em cada um dos blogs aumenta significativamente a tua hipotese de ganhar um pack de fabulosas flores IAR. Commenting along the way highly increases your chance of winning the prize package. O Blog Hop terminará os seus comentários às 11:59pm PST no Domingo dia 7 de Dezembro 2013. As 2 vencedoras seram escolhidas aleatoriamente de 2 blogs diferentes e as vencedoras serão comunicadas no blog dos desafios da IAR. We will be randomly selecting 2 winners from the comments on two of the blogs and will announce the winners on the I Am Roses Challenge Blog. O meu projecto para este desafio é um Presentinho de Natal recheado de Chocolate. Comprei 4 decorações de natal no Jumbo, com feitio de presente, todo cheio de glitter em vermelho e dourado. Colei as decorações juntas e fiz uma caixa para colocar bom-bons. As flores que utilizei foram as Rosas R21, os Lirios LY1, as pequenas S10, e as flores em croché ZJC3. I bet the pics don't do it justice! I do like it very much! This is a great idea for Christmas candy. I love it. So pretty! Full of so many colors and glitter. Love it. beautifully decorated candy holder, the flowers are awesome! Uma ideia bem original. Belíssimo presente! Lovely creation. thanks for sharing ! Love all of the sparkle in this project. Thanks for sharing! 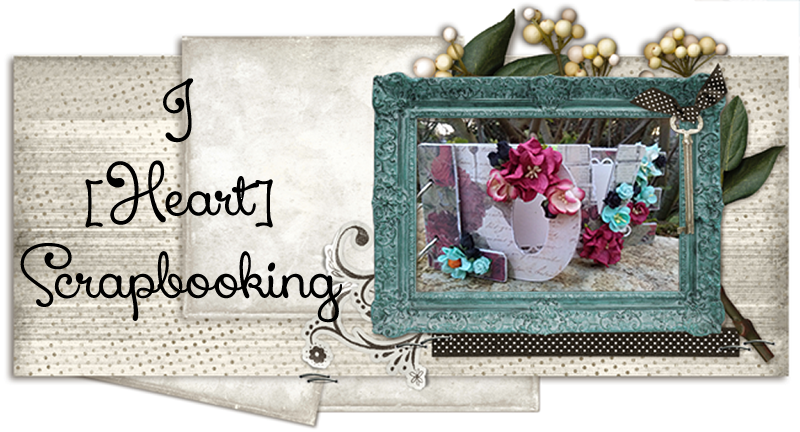 Very nice, IAR flowers are stunning for any project. Tenho adorado a viagem pelos blogs! Tantas meninas tão talentosas!! Adoro o teu projeto, aliás como todos os teus trabalhos!! 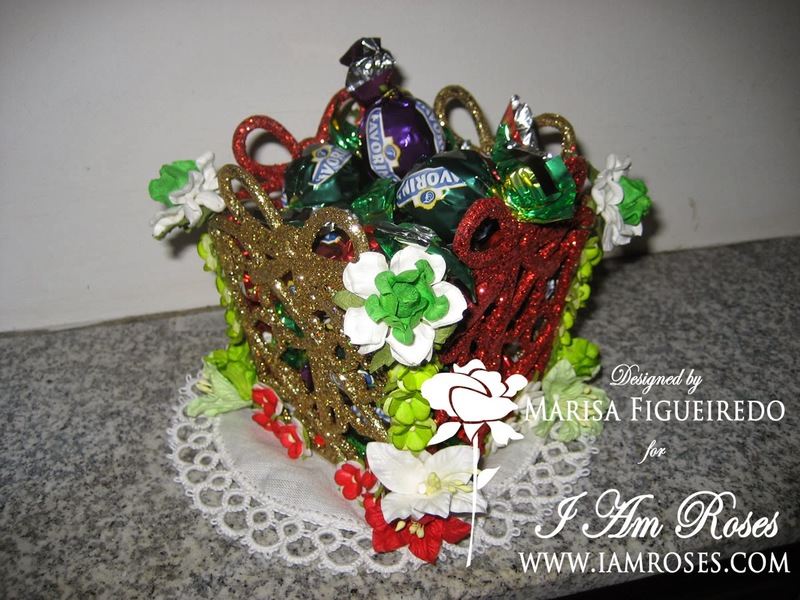 very festive display box for chocolates.